On Friday, an organization called East Village Cares held a rally at City Hall in support of turning the former P.S 64 and CHARAS/El Bohio community center on Ninth Street into a dorm. According to the Daily News, some of the 30 people who rallied behind organizer Jose de Yarza, co-owner of Donostia on Avenue B, were hired extras. 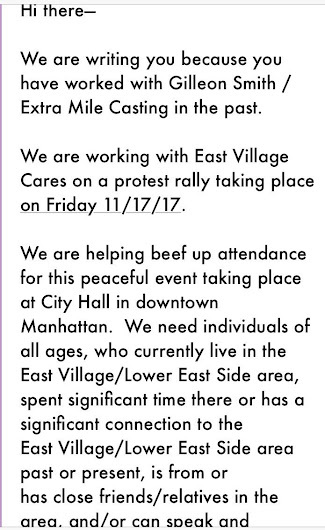 The News reported that they obtained a copy of the casting email that was seeking people to "beef up attendance" for the rally in exchange for a rate of "$50 CASH / 2.5 hour booking." “Note this is a real live protest, and protestors MUST look real and be enthusiastic and verbal about the subject. Signs will be provided by production,” it read. 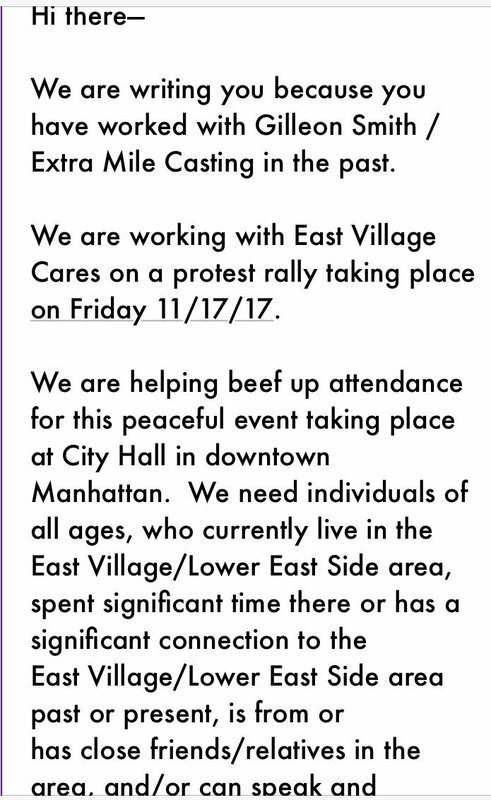 Gotham Government Relations & Communications, the lobbying firm who reportedly organized the rally on behalf of East Village Cares and P.S. 64 landlord Gregg Singer, strongly denied the use of paid extras. “We absolutely categorically deny any connection to any of those things that are alleged,” founding partner Bradley Gerstman said, adding he had no knowledge of the casting company. The Villager reported in its current issue that Gotham Government Relations was "best known for engineering the announcement of Donald Trump’s presidential campaign, complete with cheering paid actors." The Villager also reported that Singer has retained Gotham's services for $12,000 a month, starting this past July. Community activists, preservationists and some local elected officials have long been opposed to Singer's plans, and want to see a return to use as a cultural and community center. In a recently published article on the topic, The Indypendent included a statement from Gotham stating in part: "The East Village has changed in the 20 years since P.S. 64 was sold. The original group that occupied the building has no presence in today’s community." Last Monday, Community Board 3's Arts & Cultural Affairs Subcommittee passed a resolution supporting de Blasio's call to reacquire the property, as Patch reported. The full Board is expected to vote on the resolution next Tuesday. $12,000 a month?! To pay a few extras $50 for 2 /2 hours? It's good to see Singer getting ripped off like that. I wonder what Jose de Yarza's angle is. More foot traffic for his bar? More likely some Singer cash. I can't imagine the city getting the building back but hopefully it gets dragged out until Singer goes bankrupt. And then the building can become a five story Duane Reade and fit right into the current neighborhood. Save you casting money Mr. Singer, De Blasio talk of taking back this building was just about getting re-elected not that he has accomplished that he will be back in your and all the other big developer's pockets soon enough. You can tell these are fake protestors from the picture in the Daily News. They are all holding up homemade looking signs that were obviously mass produced by the same person to make the protest look authentic. You need to make your signs look a lot different if you want to fool people. And they need to carry authentic messages. One of them reads, “Beautify The East Vaillge. Dorm Now.” Others read “Who is Aaron Sosnick?” Yes, these are the issues that real East Villagers care about. Dummies. The UN protests up at Dag Hammarskold Plaza are just like this. I have seen the Turkish and Iranaian embassies bussing in black paid protestors from church groups in Harlem who have no idea why they are even there. They are given flags and signs to wave around, Apparently the Turks and Iranians can’t find enough real protestors to make their crowds look important. Nice try Singer, your dorm project is dead as a doornail, and as phony as a paid Trump supporter. Boycott Donastia? Can I boycott a place I've never been to? The LAST thing we need in the E.V. is another dorm. Dorms have been the death of the E.V.. I was walking by Donostia when they first opened up and was looking through the restaurant and was curious what it was and when id it open. A worker who was setting up or cleaning inside the restaurant saw me and he hurried to go out, eyeing me all the time and asked "may I help you" and basically chased me out the front of Donostia. That kind of attitude and paranoia and vainglory are a reflection of its owner and the establishment. Wow, just when you think things (and people) can't get lower, someone comes along to prove how much lower it can all go. Congratulations, Donostia, you have made Santa's Naughty List. This is all just a battle of the wallets, a bunch of people are likely being paid on both sides and odds are whoever shells out more is gonna build whatever they want. Kinda crazy that owning a property doesn't mean anything if someone can just pay more to stop you from building on it. Money makes the world go round it seems. Sad that progress is stopped just because people's wallets don't agree with each other. @2:13 PM - Nobody's getting paid on the "stop Singer" side and you know that. Because there's no money in community activism. Ever. Why owners can't just build whatever they want is called a "zoning law", and this is around the 100th anniversary of NYC's, the first in the nation. When you take a break from trolling you should look into it. But stay on the clock. @2:48 PM That is where Zee Pets was before moving to 13th street and then closing. Next door is where the longtime Ave B locksmith lives. Owner was nice to me before opening as well. He was trying to get me to sign his booze petition. For the record I have nothing to do with Singer - Charas was for sale for 3 million. Singer bought it. It was only after he announced his plans for the building, and the "rich" people at the Christadora decided that they did not want to live next to a dormitory, that the elected officials got involved. No one cared until the Christadora started organizing. I never understood why the Christodora did not buy the property. 3 million is pocket change for those people. "For the record" writes anonymous. 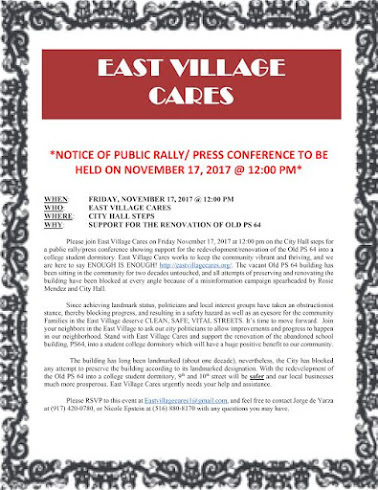 Nothing to do with Singer would imply that you don't receive money from singer or his shill group eastvillagecares. Unlikely so prove it, Mr de Yarza. The idea that "no one cared" until the Christadora started organizing is weird. That history, including the Christadoras' involvement in stopping Singers' initial 25 story building, was well documented by local journalists at the time. It also has to do with the stipulation before the bidding began [I was at the auction] that the building was to remain a community facility. CHARAS wasn't "for sale for 3 million;" there was a bidding process and Singer was an anonymous bidder. The day after the auction, someone revealed that they had found the corporation that bought CHARAS was called "Sing Fina." It wasn't just the Christodora residents that were organizing; community members and displaced artist tenants of CHARAS were also—and have been—involved. Get yer facts straight. @10:00pm: Zip it, troll; your "alternative facts" are untrue.